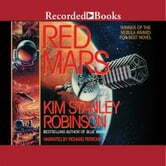 Winner of the Nebula Award for Best Novel, Red Mars is the first book in Kim Stanley Robinson's best-selling trilogy. Red Mars is praised by scientists for its detailed visions of future technology. It is also hailed by authors and critics for its vivid characters and dramatic conflicts. For centuries, the red planet has enticed the people of Earth. Now an international group of scientists has colonized Mars. Leaving Earth forever, these 100 people have traveled nine months to reach their new home. This is the remarkable story of the world they create-and the hidden power struggles of those who want to control it. Although it is fiction, Red Mars is based on years of research. As living spaces and greenhouses multiply, an astonishing panorama of our galactic future rises from the red dust. Through Richard Ferrone's narration, each scene is energized with the designs and dreams of the extraordinary pioneers.